Prepare to be blown out of the water when viewing Chad Pregracke’s Message in a Bottle Collection! Experience a unique set of memorabilia when this exhibit opens Friday, June 1. Pregracke, the Living Lands & Waters crew, and volunteers spent almost two decades finding messages in bottles across the country. 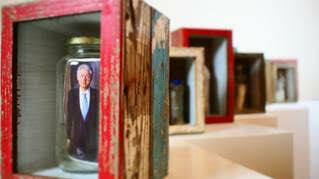 Each bottle is displayed in a box made of reclaimed wood found during the river cleanups. Now you get the chance to discover the messages sent down waterways while learning about the importance of cleaning America’s rivers. The collection will be at Minnetrista June 1 through September 30. Owned and Curated by Chad Pregracke, Founder & President, Living Lands & Waters. Organized by Message in a Bottle, LLC. For more information about Chad Pregracke’s Message in a Bottle Collection, as well as for high-resolution photos, click here. For more information, visit minnetrista.net or call 765.282.4848. Follow us on Facebook and Twitter for the most up-to-date information on our exhibits and events.